I used to be a huge consumer of paper products in the kitchen. I loved paper towels (the expensive ones! ), napkins, and those disinfectant wipes. I used paper plates when I didn’t feel like doing the dishes and I wiped up every spill with a paper towel. I always felt guilty about this as I knew it was wasteful and I was trying to live a greener lifestyle but I just couldn’t part with my paper. Then one day, I decided enough was a enough and I started on a journey to get rid of my beloved paper products and I am mostly done with them other than occasionally buying them for picnics and such. 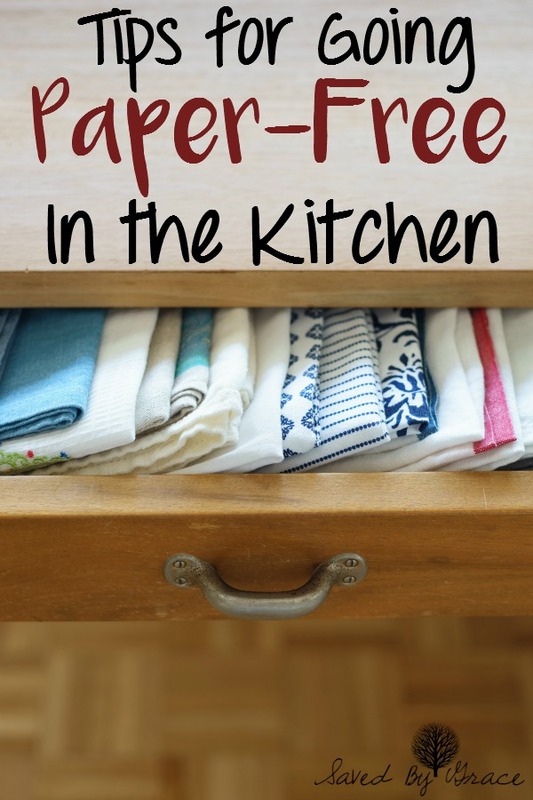 If you want to go paper free in your kitchen but not sure how you will ever part with your products, here are some tips for how to go paper free in the kitchen that I hope you will find useful. Make small changes. For me, the first thing I did was stop using paper napkins. I went to the thrift store and bought lots of cloth napkins for 25 cents each and started using these when the need arose for a napkin. This was a low cost first step to take and since we didn’t use napkins all that often on their own (we mostly used paper towels in their place), it was an easy one to make the switch to. Check out local thrift stores for towels and rags. You can also make your own from old towels, t-shirts and even clean socks with holes. I have a lot of rags now that I use in place of paper towels for things like spills. Buy some microfiber clothes and use them in place of paper towels. I now love using microfiber towels and cloths instead of paper towels because I find them easy to keep in a drawer and they ares great for holding lots of liquid because they are far more absorbent than paper towels. I use them for cleaning, wiping out my sink after use and wiping down my cabinets and oven. I have about 10 of them and this seems to be a good amount for starting out so you aren’t doing too much laundry. Get a small bucket to place under your sink for your dirty rags and cloths. I bought a simple ice bucket from a thrift store that I use to toss my dirty rags, napkins and towels into when I am done using them. This keeps them out of sight until I am ready to do a load and makes it super easy to just dump them all in at once into the washer. Wash your microfiber cloths alone. I learned the hard way that you don’t want to wash microfiber with anything else because lint sticks to it like crazy and no one wants lint coming off on clean dishes or counters when you go to dry them. Keep cloths where they are convenient for everyone and will get used. Make sure your family knows of your plan to go paperless and keep towels where they are easy to reach. You can do it like I do and keep them in a kitchen drawer or you can set up a pretty glass jar on your counter for folded cloths to easily access. Whatever works for your family! The trick is to keep things just as convenient as they were with paper products. Resist the urge to buy paper products at first. It will be hard to transition, but if you resist the urge to give into paper products you will find that it becomes very easy and you will be paperless in no time! If your goal is greener living, you might want to research the environmental consequences of using microfibers. Hi Jean, I do think that while they can be deemed poor for our environment because of the shedding of the fibers, I think for me, personally, the trade off is higher when compared to the thousands of trees saved and processing that goes into making paper products such as paper towels since one microfiber cloth can be used for years at a time. As with many things that are green, I think it’s important to not just look at the facts behind something, but the trade-offs as well. Thank you for stopping by! Very inspiring tips! Thank you! I’m curious what you do when you fry foods like bacon or hamburgers. I always place mine on paper towels and blot them with more paper towels to remove any excess. How does that work going paper free? Hi Tracy, I don’t very often cook hamburgers on my stove (I usually grill them if I make them) and I bake my bacon so I never need to do that, either. In both cases, the foods drain the grease in the cooking process.